I’m struggling with the idea of having a dedicated sticking board though. 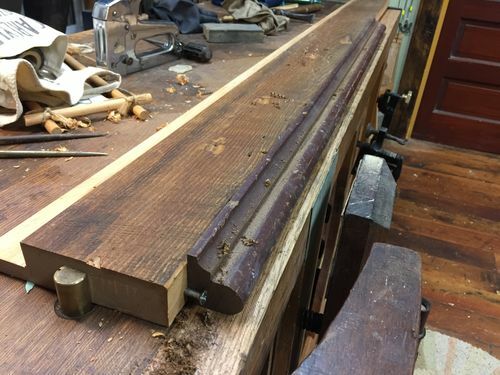 To make trim for ‘typical’ casework, I’m guessing 6’ or so of a continuous run is what you’d want… so the board would be at least 6’ 6” long. And to adjust for different widths of stuff (so the edge of a 4” or 5” wide piece of stock could always be positioned to slightly overhang the sticking board OR be fully supported, either one), the top ‘fence’ needs to slide and the base of the jig needs to be 8” to 10” wide. That’s one helluva jig to store. Anyone else gone through this kind of angst? Am I overthinking? Dialog sought, thanks. Mebbees, a fence permanently attached to an edge of a workbench? Or, perhaps, hinged to same? So it can be swung out of the way? I’ve honestly never given any thought to how people who do such things hold the workpiece. Just always assumed it’s held between dogs on a very large bench top. 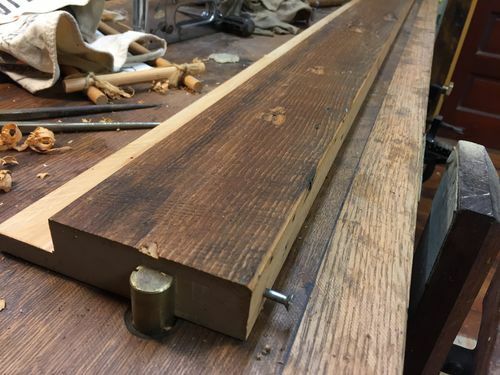 If you’re working stick stock, Mark, the center of the longer piece needs to be braced against the long fence of a sticking board so the plane can be held to it. Less of a concern when edging a 1×4 or more, but it’s still the concern. At least that what I’ve read and how others do this. The Schwarz has evolved to tacking a 1x piece of stock directly to the top of his workbench to serve as then fence when sticking mouldings; I’m not there (yet) in my thinking. gosh – I hate to see you overthink it. Perhaps you should trade me all those lovely planes for my old PC690 router. Problem solved! 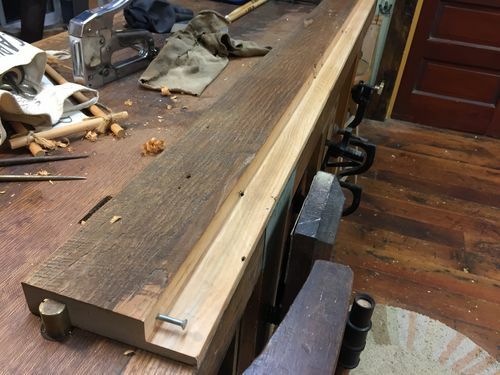 I have a long batten with dowels spaced to fit the dog holes and runs 90* across my bench. I then just use my holdfasts to clamp down a piece of stock parallel to the front edge leaving enough room for the stock being worked on. This has worked well so far. ^^ Now that’s smart thinking! Strong contender right there… One 90 degree jig and scrap vs. a big sticking board. Smitty, I don’t recall if your bench has a tail vise of some sort or not. If it does, clamp the piece of stock between it and a dog and use Kevin’s idea to support the back with a fence held by holdfasts. Don’t know if my feeble description makes sense of not. 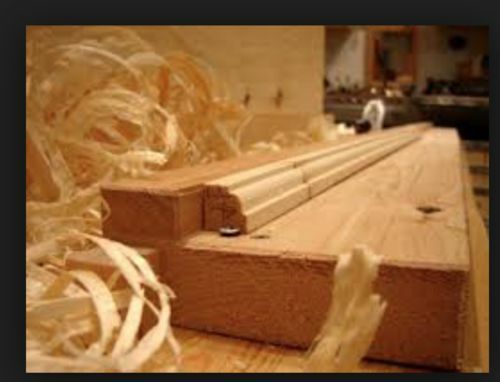 Edit: Instead of the batten that Kevin uses, use a wooden bench dog and one in the tail vise. Then copy the rest of his setup. to use the board or bench top as a reference face for the fenceon your plane like the #45. I think you could modify it to suit your needs. this is the stop I am talking about, I use it at the left end, instead of the wooden strip to hold the piece in place . 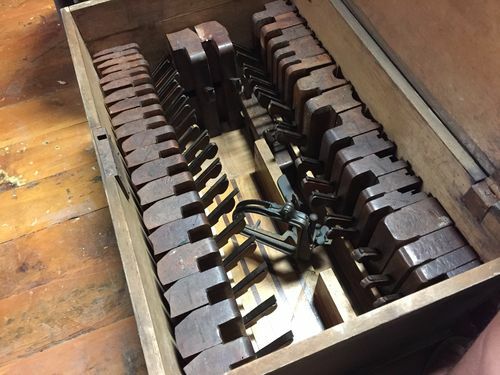 I don’t see why you couldn’t make the planning board be assembled out of say four 20” pieces that lock together with hold fasts and tongue & groove or sliding dove tails and/or screws or other metal hardware. Maybe a set of lock together bench hooks. I will think about how to engineer this, but I am sure collectively we could find a solution. Thank you, OleTexasBoy, for posting your blog page, because in those pages I was inspired to try this solution. It also traces to Kevin and Duck’s comments, I’d say. The board is a salvage piece of thick-ish stock rabbeted on one edge and cut straight on the other. 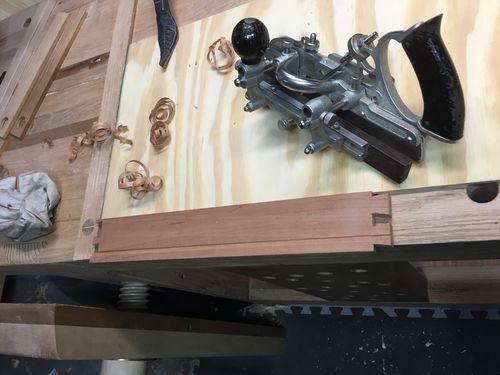 So I’ve ended up (at this point, anyway) with an appliance that’s just under 6’ long, pinches between end vise and bench dog/stop, and uses the bench as the base when larger pieces of stock are being worked. Good for a start, let the shop trials begin! Might add a 1x piece on top of what I’ve got; one that’s grooved along one edge in case I have the urge to try sash. Thanks for contributing to the thought process, fellow LJs. I thought the problem was how to store the appliance.